If you’ve been involved in a serious motorcycle accident as the result of someone else’s negligence, filing a personal injury claim is likely the best way to recover damages. Mounting medical bills make for a stressful time, and the right personal injury attorney can take the stress off you. 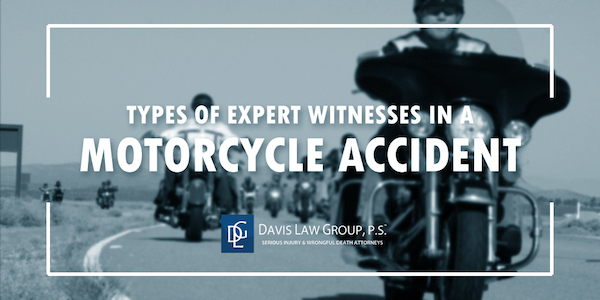 The Washington State motorycle accident attorneys at Seattle-based Davis Law Group, P.S., know how crucial these cases are to their clients. With potentially hundreds of thousands of dollars at stake, your attorney should know which type of expert witness could help you get the best settlement possible. Accident reconstructionist: In a serious motorcycle accident, there is often some debate about who or what caused the accident. The circumstances of the collision may be complex, and an accident reconstructionist can help paint a picture of how it occurred. This expert will examine all the available evidence – photos of the accident scene, the vehicles involved, skid marks, etc. – and formulate a clear idea of who was at fault. Economist: Because motorcycle accidents are often so serious and life-altering, economists are often used as expert witnesses to help give an estimate of the motorcyclist’s accident-relate damage. Things such as medical expenses, lost wages and lost earning capacity are all considered. Doctor: As stated above, the injuries suffered by motorcycle accident victims are usually serious. Doctors and other medical professionals can determine how the injuries occurred and how those injuries might affect the victim’s long-term quality of life. Doctors can also testify to how much pain and suffering a victim may have incurred. Lastly, when the defendant’s insurance company argues an injury was pre-existing, a doctor can provide evidence to the contrary. Automotive expert: When an accident is caused by a defective or faulty piece of equipment, automotive experts can offer testimony to prove the manufacturer or mechanic is responsible. Vocational expert: Because of their serious nature, motorcycle accidents often impact a victim’s ability to perform their job. Vocational/occupational experts provide evidence to how a victim might be affected in both the short and long term in their line of work. Mental health expert: Many motorcyclists involved in a serious crash are left with psychological issues or a fear of riding. A psychologist can testify to the extent of the mental health issues. If you or a loved one was injured in a serious motorcycle crash, you may need to rely on a financial award from the at-fault person or party that caused your accident. 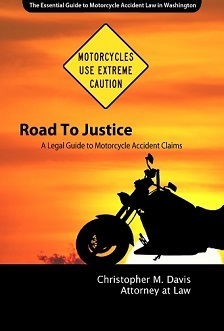 Motorcycle accident victims often face significant challenges when pursing compensation. Davis Law Group can help accident victims obtain testimony from witnesses who are experts in fields relevant to their cases. Contact Davis Law Group to schedule a free case evaluation to discuss the details of your case with one of our knowledgeable legal professionals. Call (206) 727-4000, use the chat feature below or use the contact form on this page.